My research interests focus on motor control and pain mechanisms and treatment. Our pain research involves basic and clinical studies on the mechanisms and therapeutic interventions of common neuropathic pain conditions. We use animal models to study the mechanisms and therapeutic strategies of neuropathic pain. Specifically, we are interested in the interaction of the immune and nervous systems in pain and identification of new therapeutic targets. We are particularly interested in studies that help translate basic research findings to safe, efficacious, and cost-effective care of patients. We also conduct a large number of clinical studies of innovative treatment modalities for chronic pain conditions. In motor control, we study the interneuronal mechanisms for the control of locomotion. Paraplegic patients dream to be able to walk again after spinal cord injuries. A practical issue concerns the feasibility to reactivate the spared spinal neural circuitry to control some of the lost locomotor functions. It is critical to understand the properties of interneurons and their interactions within the spinal circuitry in order to unlock this potential. Intracellular recording are performed in the in vitro mudpuppy spinal cord-forelimb preparation during walking-like movement of the limbs. Four classes of interneurons are identified within the recently identified flexor and extensor centers of the mudpuppy. The goals are to unravel common principles that govern the organization and operation of the neural circuitry for walking. Chronic pain is common and often difficult to treat. We are interested in identifying safe, efficacious, and cost-effective therapies to relieve the suffering of patients. We are particularly interested in new therapeutic modalities that may help to relieve debilitating pain that originates from lesion, injury, or disease of the nervous system, such as postherpetic neuralgia, peripheral neuropathy, and nerve entrapment syndromes. We aim to achieve our goals by using animal models to better understand the mechanisms of pain and to test new and promising treatments. Our projects include analgesic cell therapy based on stem cell technology, medications that modulate the interaction between neurons, glia cells, and immune cells in the nervous system, and interventional procedures that can modulate or block painful signals transmitted to the central nervous system. We also conduct clinical studies to test and compare the efficacy of different treatment modalities to guide clinical practice. 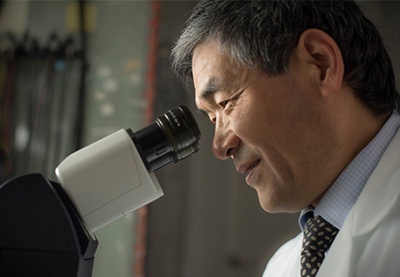 A unique aspect of our research is that we use a combination of laboratory investigation and clinical study to address important problems that the patients present everyday. Our research was initiated with grants support from the National Institutes of Health and is currently sponsored by the Department of Defense. Promising new research from the lab of Jianguo Cheng, MD, PhD, Department of Neurosciences, Lerner Research Institute, and Department of Pain Management, Anesthesiology Institute, shows that stem cells can prevent and reverse opioid tolerance and opioid-induced pain sensitivity in two preclinical models. These findings may have important implications for the opioid epidemic sweeping across the United States.